The District was previously divided into four municipalities—Alexandria County, Georgetown, Washington County, and Washington City.4 Although many residents lived elsewhere during the hot and humid summers, the official population then added up to about 45,000 people. 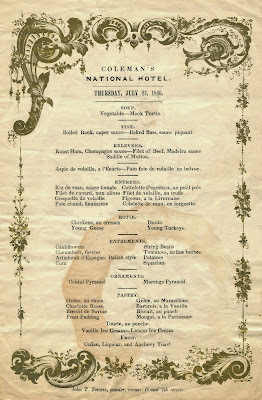 Visiting statesmen and other high-ranking officials, including the presidents Andrew Jackson and James Polk, often stayed at the National Hotel on Pennsylvania Avenue at 6th Street, only a few blocks from the unfinished Capitol Building.5 The foodways of the ruling elite are illustrated by a menu from this hotel on July 23, 1846, two weeks after the Congressional vote giving back the land to Virginia. What makes this menu a particularly thought-provoking document is the printer's mark, recalling the bigotry that was a byproduct of the fast-growing country. Although the dishes shown below reflect various European influences, such as the Spanish artichokes prepared in the Italian style, the overall tone of this menu is decidedly French. Gone were the days when an anti-federalist leader like Patrick Henry thought it relevant to accuse Thomas Jefferson of an effete taste for “French cookery.” Things were different now. 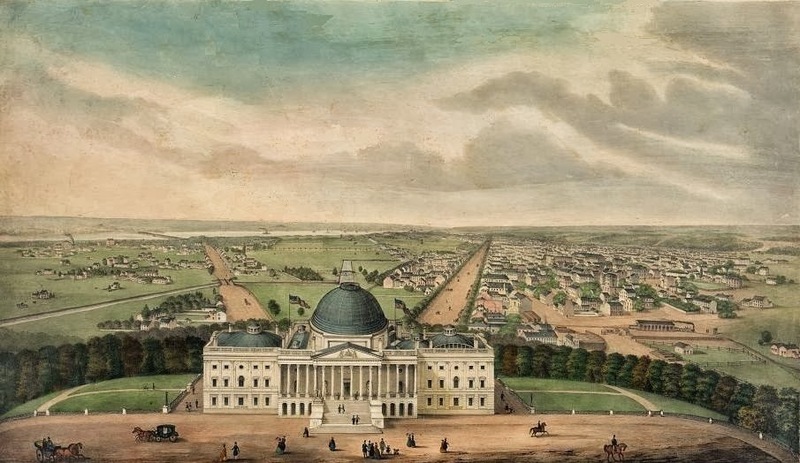 Despite the egalitarian ideals of the Jacksonian Democrats, its leaders dined well, or at least well enough that it once became a political issue. During the campaign of 1840, the Whigs boasted that their candidate, William Henry Harrison, lived on “raw beef without salt,” while alleging that their opponent, Andrew Jackson’s hand-picked successor, President Martin Van Burn, luxuriated in strawberries, raspberries, and cauliflower, which happens to be one of the many “extrements” (sic) on this summer bill of fare. In 1846, little could anyone have imagined that the failed harvests in Europe would spark a great wave of immigration, causing the Roman Catholic Church to become the largest religious denomination in the United States by 1850. This development fomented hatred and intolerance in the middle- and working-classes, giving rise to a nativist party that would briefly propel his political career until its membership fragmented over the issue of slavery. 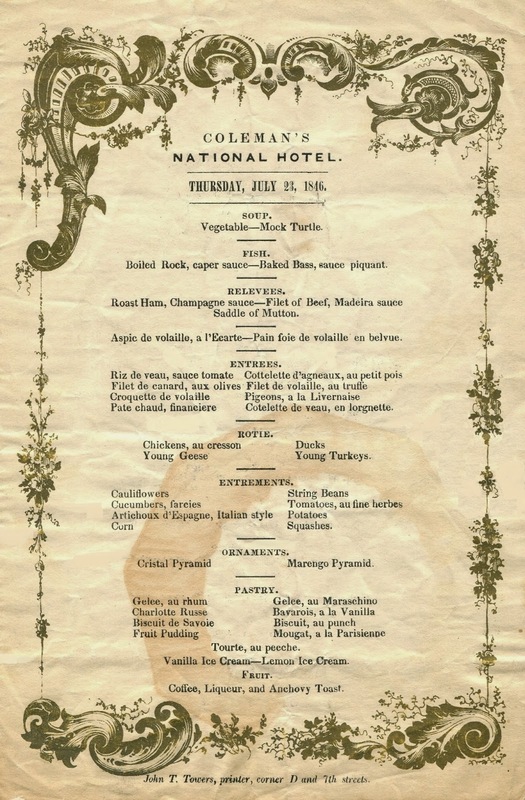 However, when Towers printed this menu in his shop on D Street, he probably did not think about the famine that was already raging out of control in Ireland, for the furious westward expansion was an all-consuming endeavor, distracting the nation from even its own impending disaster—a Civil War that would later seem as predetermined as its relentless drive to the Pacific. 1. The three British colonies in North America—Nova Scotia, New Brunswick, and Canada—were united under the name of Canada in 1867. 2. 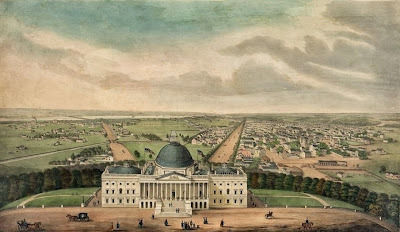 The Compromise of 1850 outlawed the slave trade in the District of Columbia; slavery was not abolished there until April 1862, less than nine months before the Emancipation Proclamation was issued. 3. 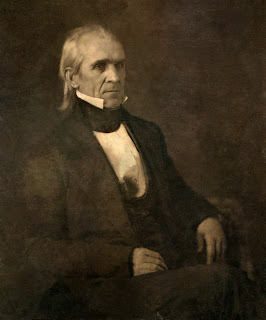 Polk owned slaves on his plantation in Tennessee. Although a neighbor and fellow-slaveholder famously described him as “a warmhearted paternalist,” there is evidence to suggest that this portrayal was designed to help Polk win the nomination. After becoming president, he continued to buy slaves, always instructing his agents to conceal his identity in order to preserve his public image. William Dusinberre, Slavemaster President: The Double Career of James Polk, 2003. 4. In 1871, the three remaining municipalities of the District of Columbia were consolidated into one named Washington, D.C.
5. 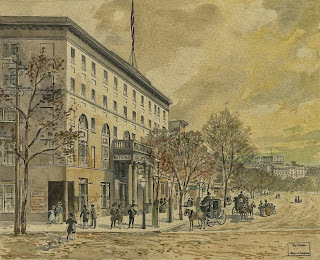 Established in a row of federal townhouses acquired by John Gadsby in 1827, the National Hotel was often called Gadsby’s in its early days. 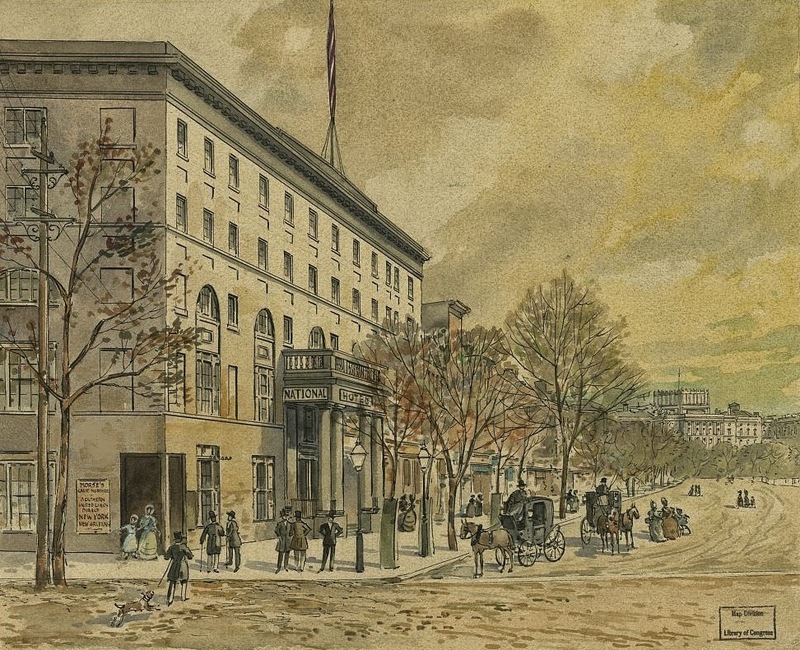 Renamed Coleman’s National Hotel by 1846, it continued to expand over the years through the accretion of smaller buildings. Kentucky politician Henry Clay lived there for many years and died in his room in 1852. John DeFerrari, Historic Restaurants of Washington, D.C., 2013. SOunds like the same crazy as we have now with immigration. Menu is staggeringly wonderful. Noticed those chicken croquettes that also appeared on the Lincoln menu... obviously a Washington standby (and no wonder, they are so good). The dishes are very elegant, aren't they? Bravo Henry! Interesting inter alia to see the chicken (and perhaps presumably sometimes it was turkey or other feathered) croquettes. I can remember in modest lunch restaurants enjoying this dish into the 1970's. This was in French-influenced Montreal but I'd guess croquettes, often with a gravy of some kind, had survived elsewhere too. They had lost their social status by then, but who cares, they tasted great. The 80's seems to have done them in. Time for a revival!